Finally, here it is: the long-awaited energy transition. The wave of resistance against nuclear power after the catastrophe in Fukushima pressured the government into a new law for phasing-out nuclear power. As a consequence, eight old nuclear power plants were immediately decommissioned, after all. The power of the four big energy corporations seemed to be broken und the way paved for the age of renewable energies. But at the same time, widely unnoticed by the public, lignite is enjoying a renaissance. Although this type of coal is one of the most damaging energy sources, it still provides 25,4 % of our energy supply. Lignite is supposed to be exploited until at least 2045. This prospect ridicules every illusion, that Green Capitalism ever promised, and destroys the vision of an energy supply out of 100% renewables. Therefore it’s not enough to demand the expansion of wind and solar power. In Germany, the conflict about a liveable future without a disastrous climate catastrophe revolves around phasing out of lignite. But this is only possible with a radical grassroot movement which offers resistance against the fossil-capitalist system and takes the necessary changes into their own hands. Apart from the Tar Sands, lignite is the fossil resource that is most damaging to the climate. One ton of this climate culprit make one ton of CO₂. In Germany, every year 176 million tons of it is exploited – as much as nowhere else in the world. The mining areas lie in East Germany (Lausitz and near Halle and Leipzig) and in the Rhineland near Cologne and Düsseldorf. In the Rhineland coalfield, the energy corporation RWE operates three open-cast coal mines and four huge power plants, which are responsible for 13% of the German CO₂ emissions, and can also in other aspects not be surpassed in gigantomania. The biggest excavators of the world eat themselves with their bucket wheels through the region and destroy everything that comes in their way. The Hambach mine boasts a surface of 8500 hectares, a depth of 350 metres, and is therefore the biggest in Europe. For profit’s sake, ten thousands of people are evicted, and villages dating from the middle ages are destroyed. The Federal Mining Law continues to provide RWE with specials privileges, even though it originated in feudalism and was ‘reformed’ during the Third Reich. Property, usually the holy cow within capitalist values, is daily expropriated, and fundamental rights of the residents are violated. Not only villages are digged away, but also fertile farming land and the former 4500 hectares of the Hambach Forest. The forest is more than 10.000 years old and used to be the biggest forest in the whole region. It is home to a large variety of rare species of plants and animals, such the nearly extinct Bechstein’s bat. The high percentage of hornbeam, small-leaved lime, oaks, elder and dead wood make the Hambach Forst a remarkable relict of European rank, because forests like that do not usually exist in the Middle European loess-lowlands. Every year, RWE take out their chain saws to clear cut a further part of the remaining 1000 hectares, so the mine can expand. RWE promote the image of a good and safe employer that invests in the region. The disastrous local and global consequences of the open-cast coal mine remain unmentioned. Even people who are not evicted suffer from the lignite complex. For draining the pits, ground water is pumped off until a depth of 750 metres, causing the ground to sink for several metres as far as 30 km away. The consequence of the so-called ‘sump dewatering’ are damages in buildings, and in ecosystems depending on ground water. Moreover, the health impact in the mining area is extreme. The open-cast coal mines emit more particle matter than the complete German car traffic. The huge amount of excavated material releases more radioactivity than a nuclear power plant, because of the natural percentage of uranium in the ground. Radioactive isotopes can enter the lungs together the particle matter. Apart from the Uranium, more poison lies dormant in the coal. During the process of burning coal, the power plants release not only big clouds of water vapour and carbon dioxide, but also mercury, arsenic, lead and cadmium. RWE are not a benefactor for the region, but resemble a feudal lord who holds all strings in his hand. Through their tight and efficient network, and closely woven relations with local governments, media and party politicians, RWE can assert their interests, on local level as well as within the EU. Therefore the energy giant benefits from billions of subsidies for coal mining, from tax reliefs and advantages within the European Carbon Trading System. Moreover RWE do not come up for the cost for eternal damages caused by the mines – same story as with nuclear power. RWE stands for an authoritarian reign and production model from former days. Erstwhile, lignite mining was a source of prosperity, but the consequences for nature, humans in the Global South and future generations are increasing continuously. Climate change continues to intensify, even worst-case scenarios for global CO2 emissions increase and are surpassed. Since the beginning of the unsuccessful and hopeless climate summits in 1990, CO2 emissions are rising for more than 50% instead of declining. In the media, there is hardly one day without reports on extreme weather events as droughts, forest fires, tropical storms and hurricanes, which primarily hit the people in the Global South who become impoverished by the global capitalism, anyway. After the climate summit in Copenhagen in 2009, many grassroot activists realized that protests against political and medial major events have less effect because claims for climate protection would not build up a movement. Therefore, it was important to strategically rethink and to organize resistance in a decentralized way. Like this, it may succeed to empower the people themselves and to realize the social change which is needed. In the Rhenish lignite field, in the year 2010 more and more groups and individuals had the will to build up a climate movement in a place where climate change, which usually is such an abstract phenomenon, is visible by the destruction made by the open mining. Civil disobedience and direct actions make it possible to directly intervene into and stop this demolition machine. Since this time, every year a Climate Camp is organized which, for weeks, embodies a kind of society experiment. It shows how a good and resource saving life for everybody is possible by cooperation and networking with others. Via the diverse actions, climate protection becomes practical and a training programme provides the necessary elucidation. Indeed, until now, the number of participants is still small compared to the actions against nuclear waste transportations in the Wendland. Nevertheless, there it took many years until a place for crystallisation for energy struggles was formed. By actions like rail blockades against coal trains and (forest)occupations, the movement succeeded to attract a lot of attention by the media and to make the conflict about lignite visible. intending to be active in the Rhenish lignite field in the long term. By a radical ecological and anti-capitalistic self-conception, the Social and Ecolgical Question is combined. AusgeCO2hlt’s targets are an immediate lignite phaseout and a bottom-up renewable energy supply. The latter shall be decentralized, social, ecological and self-governed – thus without energy corporations which need to be socialized. Within the spectrum-comprehensive and basis democratic network, activists from organizations like BUND Jugend and Attac to left radicals and eco anarchists are active. The campaign is only one part within the versatile movements in the Rhenish lignite field, as for example the forest occupants of the Hambacher Forst. From the beginning, focus was set on an intensive networking and collaboration with the local citizens’ initiatives and politicians showing solidarity. As consequence, more and more residents visited camps, occupations and other events, who until this time had not actively taken part in politics. Instead of a determent because of radical points of view, non-violent actions with tunnel systems and hog-tying against eviction resulted in growing solidarity on local and national level. In November 2012, the forest occupation in the Hambacher Forst was evicted by a big police contingent. The eviction took four days, attending solidarity actions took place in 12 cities. The large scale operation ended up by a following occupation of a meadow nearby the forest. In order to protect the Hambacher Forst, more actions are planned for year 2013. 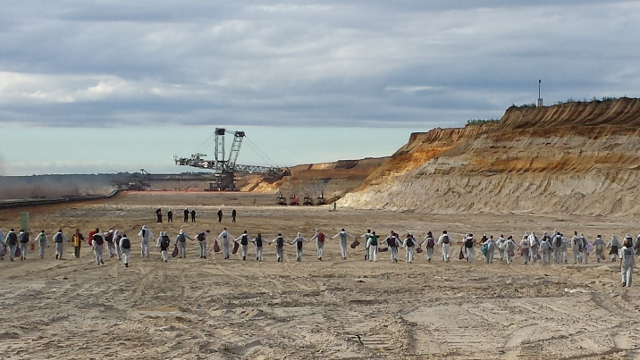 Further, the Energy Struggle-Tour takes shape, aiming to connect the places of resistance and ending up in the Climate Camp in the Rhenish lignite field. But this camp is not meant to be the only one. The European peasants’ network “Reclaim the Fields” is planning a camp which is partly put together with the Climate Camp. Resistance goes on and it becomes even more visible that the struggle for a lignite phaseout develops to a central, social conflict. It will contribute to question the energy demanding, capitalistic economic system as a whole and to build up alternatives from the bottom.